After a few years of looking like he was out of place at the highest level of American football, Garrett Celek might in the coming years prove to be a steal by the San Francisco 49ers as the tight end is slowly but surely coming good for his team. Celek was born Garrett Bartholomew Celek, one of six children to Steve and Debbie Celek, on the 29th of May, 1988 in Cincinnati, Ohio. At a very young age, Celek was introduced to America’s favorite pass time which he enjoyed playing with his grandfather and siblings, one of whom also went on to become a professional athlete. For his high school education, Celek attended La Selle High School in Cincinnati, Ohio where he was a star on the football team and was notably selected to the PrepSttar All-Midwest team. After high school, Garret Celek was snapped up by Michigan State University where his talents were effectively utilized right from the get-go. As a freshman, Celek played in 12 games and recorded 6 receptions for 50 receiving yards, and 1 receiving touchdown. He didn’t quite reach the lofty standards he set as a freshman in his sophomore year as he only managed to play in 10 games as recorded 3 receptions for 33 yards and 1 touchdown. Celek’s downward spiral continued into his third year in college as he only managed to play in 2 games, recording 2 receptions for 17 receiving yards which came in one of those two games. Celek’s fortunes eventually changed in his senior year in terms of appearances as he featured in 14 games. His statistics were however quite similar to the previous years. He recorded 3 receptions, 35 receiving yards, and 1 receiving touchdown. In total, Garrett Celek managed 14 receptions for 135 receiving yards, and 3 receiving touchdowns in his college career. After graduating, Celek was hoping to be drafted in the sixth or seventh round were experts had projected him to be snapped up. Unfortunately for the tight end, who was not invited to that year’s NFL Scouting Combine, he was not selected but was still able to secure a contract as an undrafted free agent with the San Francisco 49ers. He put pen to paper on a three-year, $1.44 million contract. Garrett Celek started his NFL career as the fourth tight end on his team’s roster. He made his debut for the team in a game against the New York Jets before going on to record 4 receptions for 51 receiving yards in his rookie season. The following season, Celek moved up a place to become the third tight end on his team’s roster but however only still managed to make 2 catches for 38 yards in 12 games. For the 2014 season, Celek suffered numerous injuries which limited him to making just 3 appearances with 2 receptions and 53 receiving yards. The following year, after signing a one-year, $710,000 contract to remain with the 49ers, Celek enjoyed his best season so far as a professional as he notched 19 receptions for 186 receiving yards, and 3 touchdown receptions. That performance earned him a new four-year, $10.20 million contract in 2016 which proved to be the motivation Celek needed in notching up 29 receptions for 350 receiving yards and three touchdowns in 16 games. Garrett Celek comes from a huge family. As mentioned above, he is the younger brother of the now-retired Philadelphia Eagles tight end, Brent Celek, who was a part of the Eagles team that beat the New England Patriots to win Super Bowl LII. Before heading to Philadelphia via the 2007 NFL Draft where he was selected with the 162nd pick in the 5th round, Brent Celek played college football for the University of Cincinnati where he notably won the UC Claude Rost Award which is given to the most valuable player. He was also named to the second-team All-Big East Conference selection. 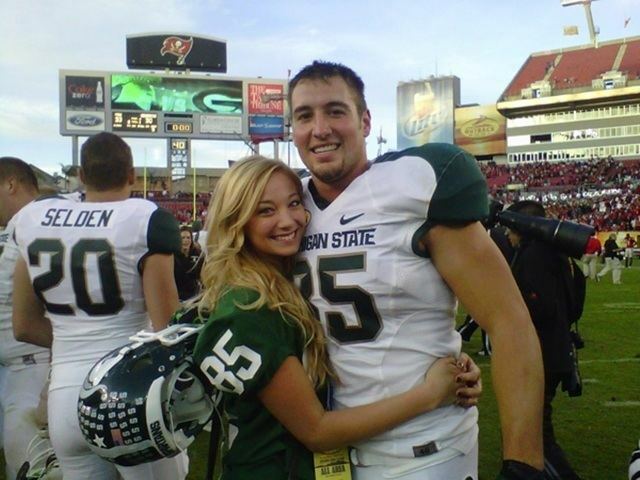 Garrett Celek is married to his college sweetheart Sarah Hinton. The duo met while attending Michigan state university where Celek was part of his school’s football team while Hinton was working as a Hooters Bikini model. Sarah Hinton began working at a Hooters in Saginaw, MI, during her freshman year. She then went on to contest in the 2010 Miss Hooters competition and the 2012 Hooters Dream Girl Aruba competition, however, failing to win either one. She has further appeared in a number of Hooters calendars, most notably being the featured model for July 2011. The couple got married sometime in 2014 but it is not clear if they have welcomed any children into the world. 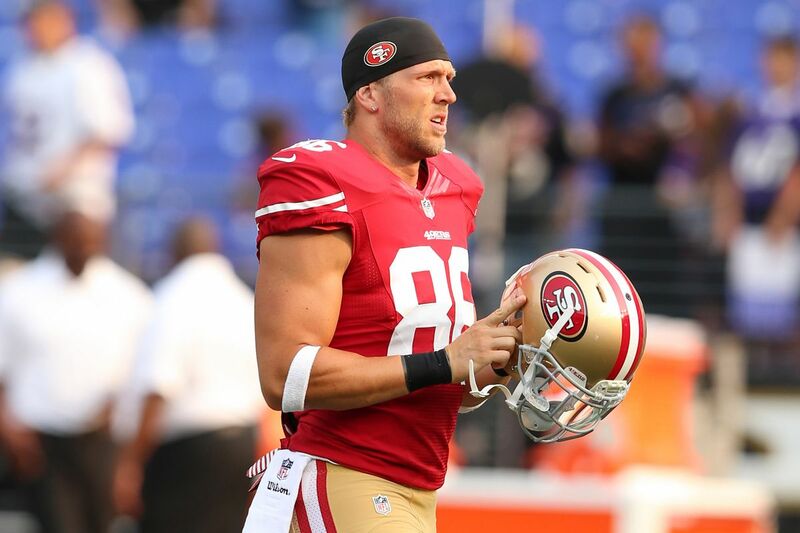 With tight ends usually being among the taller and heavier members of any team, Garrett Celek checks all the boxes as he stands at an impressive 6 feet 5 inches (1.96 m) with a weight of 252 pounds (114 kg).